Securboration Inc. has won a $40 million contract to develop and update the U.S. Air Force’s event processing environment software. 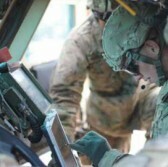 The company will migrate the software tool to command, control, communications, computers, intelligence, surveillance and reconnaissance infrastructures to help warfighters transmit and receive information, the Defense Department said Friday. Securboration will perform work in Melbourne, Florida, through Sept. 24, 2022. The Air Force Research Laboratory received 63 proposals for the indefinite-delivery/indefinite-quantity contract. Securboration is funded through the Small Business Innovative Research Program to develop collaboration tools for DoD.